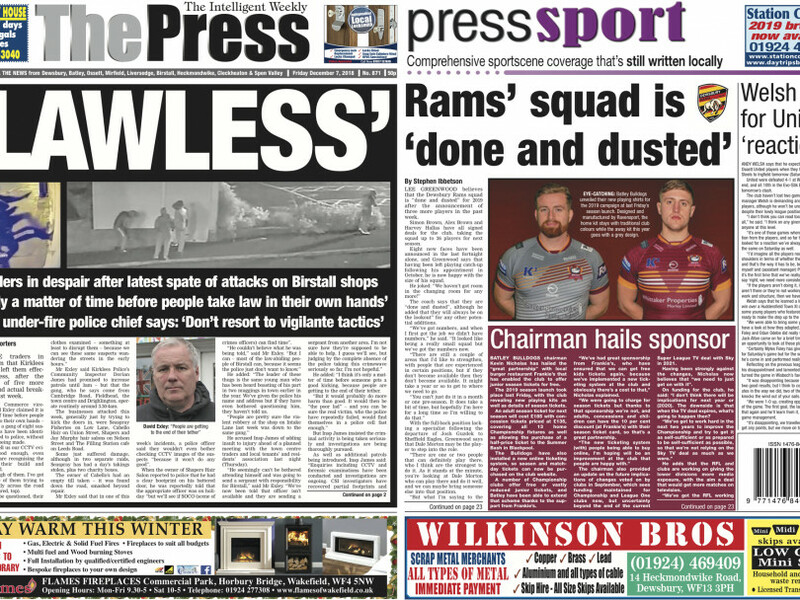 In this week's Press, we have the latest on desperate traders in Birstall who claim that Kirklees Police have left them effectively lawless, after the latest spate of five more attempted and actual break-ins in the past week. Chamber of Commerce vice-chairman David Exley claimed it is only a matter of time before people take the law into their own hands – because he says a gang of eight suspected criminals have been identified and reported to police, without a single arrest being made. A massive £69.2m road scheme designed to solve 20 years of congestion around the Cooper Bridge roundabout in Mirfield has been unveiled, and emergency services have twice combed the River Calder after reports of a person in the water in Ravensthorpe. Dewsbury folk are being called on to share their memories of the town centre as it used to be – to try to shape its future for generations to come, and Batley activists’ campaign to re-establish a town council may still be an aspiration … but now they have their own logo. In sport, Dewsbury Rams head coach Lee Greenwood says that their transfer business is "done and dusted" after three more signings were announced in the past week. Batley Bulldogs' Kevin Nicholas hails the partnership with restaurant Frankie's after the club announced free junior season tickets for 2019, and the chairman also gives his views on funding, rule changes and preparations for next season. Ossett United manager Andy Welsh is looking for a reaction after defeat at Wisbech last weekend, and he says some young players could be pushing for places after impressing in a friendly with a Huddersfield Town XI. Liversedge's short winning run came to an end as they were hit for six, while in rugby union Cleckheaton earned local bragging rights and Ossett kept up their winning start. The Bradford Cricket League have announced the new fixtures for 2019, while there's also cycling news as the Heckmondwike Cycle Speedway team are set for a return to league action next year.